There has been a church here since at least the C10th, the present church of St Mary's Rotherhithe dating from the early C18th. Rotherhithe had strong maritime connections, with many seafarers among its parishioners. In 1620 The Mayflower sailed from here to pick up the Pilgrim Fathers, and three of its four part-owners were buried in Rotherhithe churchyard. An unusual memorial in the churchyard is that of Prince Lee Boo (d.1784), the son of the King of the Belau Islands, whose monument was erected by the East India Company. The churchyard immediately adjacent to the church was opened to the public in 1909, while the main part of the churchyard had been opened as a public garden in 1901, now called St Mary's Churchyard Gardens. The remains of an earlier chalk and flint building in the form of the base of the medieval tower and church entrance have been found in the crypt of the present church, which dates from 1715. It was designed by John James and built on the site of an earlier church for £4,000 at the expense of the parish. Roman bricks were discovered in 1913 when the 1747 tower was underpinned as part of work carried out in memory of Emily Blanche Carr-Gomm, Lady of the Manor of Rotherhithe, by her son Hubert William Culling Carr-Gomm, MP for Rotherhithe. 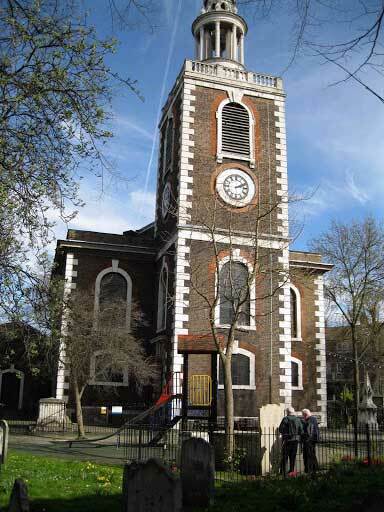 The village of Rotherhithe had early maritime links and St Mary’s was a seafarers' parish. The wooden frame of the present building appears to have been constructed by a skilled shipwright, and when the warship 'Temeraire' was broken up in 1838, famous for her part in the Battle of Trafalgar, some of her timbers were used to make furnishings for the church, including the Communion Table and two Bishop's Chairs. The Mayflower sailed from Rotherhithe to pick up the Pilgrim Fathers and thence to the New World, and many of her crew were from Rotherhithe. The sailing in 1620 is now commemorated by a Blue Plaque. Three of the ship's four part-owners are also buried in the churchyard, Richard Gardner, John Moore and Captain Christopher Jones, the Master of the Mayflower (d.1622), who is commemorated by a plaque erected in the church in 1965 and a contemporary sculpture near the church. An unusual memorial in the churchyard is that of Prince Lee Boo (d.1784), the son of the King of the Belau Islands, whose monument was erected by the East India Company. The King had rescued the crew of the East Indiaman 'Antelope' when it was shipwrecked in 1738 and Lee Boo returned to England with the Antelope's captain at the request of his father. He lived with the Wilson family in Paradise Row, but died of smallpox after 6 months, and was buried in the Wilson family grave in the churchyard. An additional plot of land was acquired by the church wardens in 1820 when the churchyard was overcrowded and more burial space was needed. This opened in 1821. After it was closed to burial, it was later converted as a public garden in 1901, now called St Mary's Churchyard Gardens (q.v.). The churchyard immediately adjacent to the church was opened to the public in 1909 and both are now maintained by LB Southwark.